Read Steve's review of Shazam! We all have a superhero inside us, it just takes a bit of magic to bring it out. In Billy Batson’s (Angel) case, by shouting out one word—SHAZAM!—this streetwise 14-year-old foster kid can turn into the adult Super Hero Shazam (Levi), courtesy of an ancient wizard. Still a kid at heart—inside a ripped, godlike body—Shazam revels in this adult version of himself by doing what any teen would do with superpowers: have fun with them! Can he fly? Does he have X-ray vision? Can he shoot lightning out of his hands? Can he skip his social studies test? Shazam sets out to test the limits of his abilities with the joyful recklessness of a child. But he’ll need to master these powers quickly in order to fight the deadly forces of evil controlled by Dr. Thaddeus Sivana (Strong). 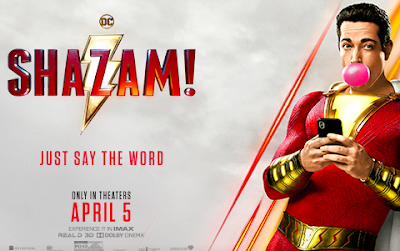 David F. Sandberg (“Annabelle: Creation”) directs New Line Cinema’s “Shazam!,” the origin story that stars Zachary Levi (TV’s “Chuck”) as the titular DC Super Hero, along with Mark Strong (the “Kingsman” movies) in the role of Super-Villain Dr. Thaddeus Sivana, and Asher Angel (TV’s “Andi Mack”) as Billy Batson. 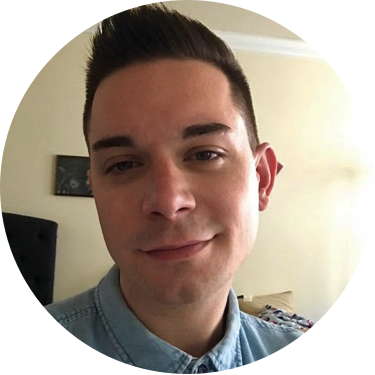 Peter Safran (“Aquaman,” “The Conjuring” and “Annabelle” films) produced the film. 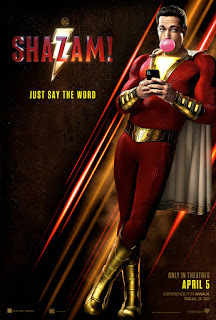 “Shazam!” also stars Jack Dylan Grazer (“IT”) as Billy’s best friend and ultimate superhero enthusiast, Freddy, and Oscar nominee Djimon Hounsou (“Blood Diamond”) as the Wizard. The cast also includes Faithe Herman (TV’s “This is Us”), Grace Fulton (“Annabelle: Creation”), Ian Chen (TV’s “Fresh Off the Boat”), Jovan Armand (TV’s “Hawaii Five-0”), Marta Milans (TV’s “Killer Women”) and Cooper Andrews (TV’s “The Walking Dead”). Set in the city of Brother Love, Shazam! introduces us to the DCU’s newest comic-to-screen adaption. We follow the struggles of orphan Billy Batson as he revels against the foster care system pursuit of his real mother. After being recently relocated to Philadelphia, PA Billy is granted a superhero personality he can summon just by uttering “Shazam!” By an ancient wizard. What unfolds in the story is heartwarming, fun, thrilling, and in my opinion instantly jumps into the top 3 of my favorite DCU films. If I had to compare, this installment feels like the DCU’s guardians of the galaxy in terms of its tone. While the story of “Shazam!” Is very old in the comic world, everything about this superhero film adaptation felt refreshing and new. The child actors did a phenomenal job and really carried the movie on their performances. I hope we get many more adventures with Shazam!